"I haven't yet declared who I will commit to internationally. 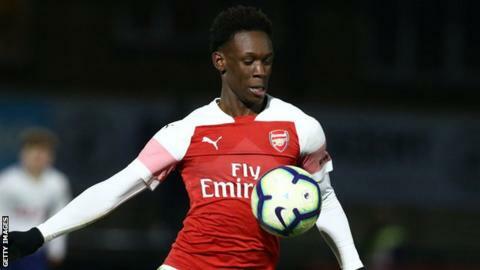 I will be discussing matters with my parents and will then decide," Balogun, who has scored 22 goals in 23 games this season, told the Arsenal website. His declaration has caught the attention of Aigbogun, who is preparing for May's Under-20 World Cup in Poland. "This sounds good coming from him. I know most of the Arsenal players and this is a very talented player to have in any team," the coach told BBC Sport. "He is a good player, but I have not spoken to him yet." Nigeria's Flying Eagles qualified for the World Cup after finishing fourth at the Under-20 Africa Cup of Nations in Niger last month. "I was born in New York, so can play for the USA. My parents were born in Nigeria and I have been in England since I was two years old, so I can play for both those countries too!" he explained. "I have several youth caps playing for England and I enjoy their style of play which is similar to Arsenal's."